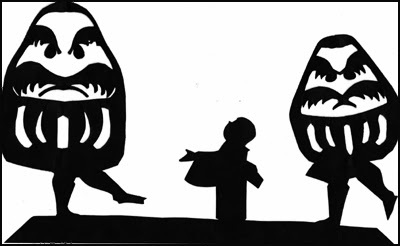 Example of silhouette art cutting at it’s finest. 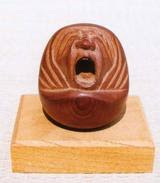 The subject is the Daruma, the father of Zen Buddhism. The medium appears to be silk fabric cut in the form of the reclining Daruma. Signed by the artist in the form of cut silk kanji characters, this is a beautiful piece that is nicely matted and framed. The pane is plexi. The image measures 14” x 20”, while the frame measures 19” x 25”. 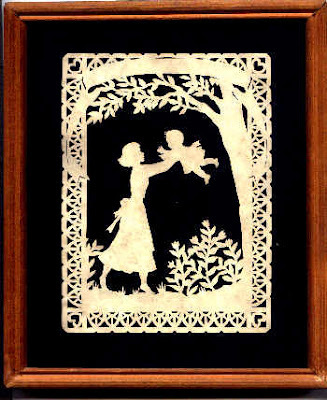 The craft of papercutting has been done for many years in many countries all over the world. One of the earliest known papercuttings is from China and dates back to 960 A.D. In Germany and Pennsylvania , Scherenschnitte (pronounced shair-en-shnit-teh) was a popular folk art in the 1800s. 'Scherenschnitte', which literally means 'scissors-cutting', was used to decorate birth and marriage certificates and Christmas decorations. All you need for creating scherenschnitte is time, patience, a steady hand and a few inexpensive supplies. The designs can range from small, simple ones to intricate,detailed 'masterpieces' and once you learn the craft you can experiment with various papers, colors, frames and projects. You can make your own unique frameable gifts, cards, invitations, notecards, and many more projects with this simple craft. If you are a first time Scherenschnitte crafter, it is best if you go over all the instructions before you start your project. China has a long tradtion of Papercutting too. 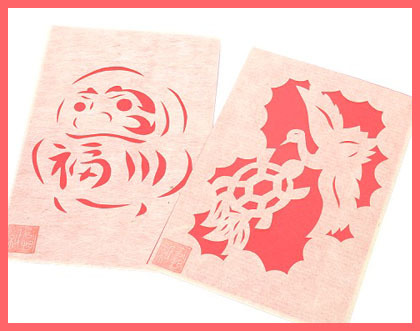 One of China's most popular folk arts is papercutting. Archaeological finds trace the tradition back to the 6th century; It is supposed that the beginnings of Chinese papercutting were even a few centuries earlier. Paper cuttings are used for religious purposes , for decoration and patterns as well. Papercuttings, which were usually of symbolic character, were part of some ritual. They also often served as decorations for sacrificial offerings to the ancestors and gods. Today, papercuttings are chiefly used as decoration. They ornament walls, windows, doors, columns, mirrors, lamps and lanterns in homes and are also used for decoration on presents or are given as presents themselves. They have special significance at festivals and on holidays. At the New Year's Festival, for example, entrances are decorated with papercuttings which are supposed to bring good luck. Some papercuttings contain either some symbol of good fortune or a Chinese character imbued with especially auspicious meaning. Usually, there is a tale to be told by each picture or character.
. Daruma Odori だるま踊り Daruma Dance . The zodiac animal for every year is put on the entrance door all year.
. Zodiac wild boar 2019 .